A California man stabbed and killed a police K-9 before being fatally shot by a police officer Tuesday afternoon. The man had also stabbed his girlfriend and thrown butcher knives at other officers, police said Wednesday. Jesus Birelas-Contreras refused to surrender before hurling the knives, according to police. Lt. Emmet Larkin fired at Birelas-Contreras, killing him, reports the Mercury News.. The girlfriend survived, but one of the Department of Public Safety's dogs, Jax, succumbed to his wounds. Jax, a 4-year-old German Shepherd, had served for two years with the department and was one of four dogs in the K-9 unit. 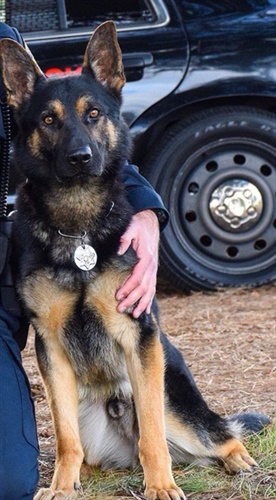 Jax was the first Sunnyvale police dog killed in the line of duty. "It's a huge loss," said Chief Phan Ngo. "He was a family member, and his void will always be felt. He will always be in our hearts."